As I write this, gentle readers, I am hearing rather loudly from my right wrist and bicep. Basically my entire right arm from the shoulder on down, which is making it hard to type. But I keep telling myself it’s worth it. For I, along with a group of able-bodied volunteers, just waged a heroic battle against a slope’s worth of stiltgrass, mugwort and garlic mustard at the foot of Bear Mountain. 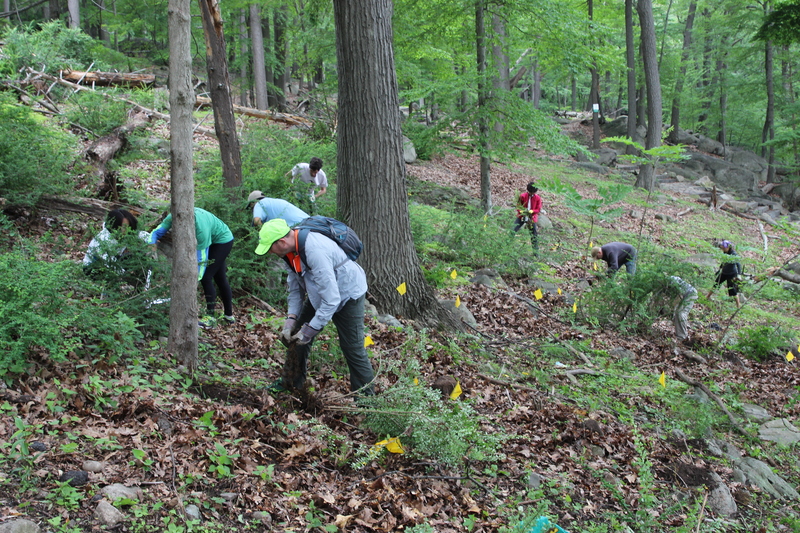 The New York-New Jersey Trail Conference was holding another invasive plant removal and native plantings work day on Bear Mountain today, Sept. 29. The work was being held in the Trails for People exhibit, on the slope where the Appalachian Trail comes down the mountain at the Bear Mountain Inn. A view from the black locust footbridge, on the ascent up the Bear Mountain section of the Appalachian Trail. It goes without saying – but I’ll say it anyway – that if you’re going to be taking on the Appalachian Trail, especially the bit that goes through Bear Mountain in New York, you’ve got to be ready to do a lot of climbing. Lots and lots of climbing. 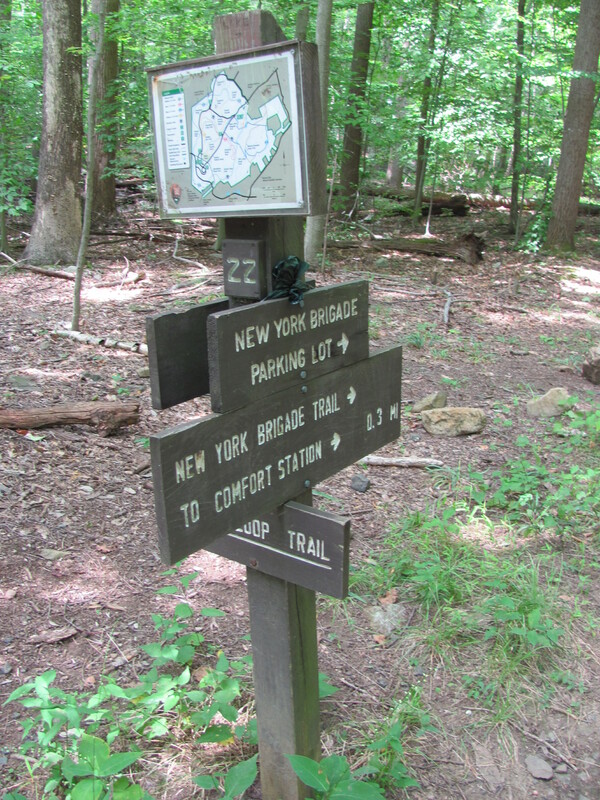 It was National Trails Day on June 6, and the New York-New Jersey Trail Conference was presenting a series of trail-maintaining activities at Bear Mountain (see my previous posting about the great barberry battle). 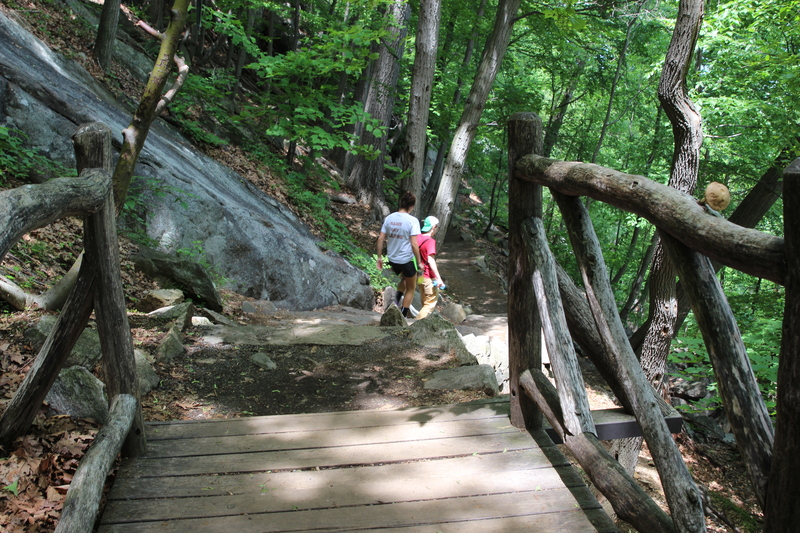 One of the conference’s longer-running projects has been a rebuild of part of the six-mile Bear Mountain stretch of the AT, including overhauling some of the many flights of stone steps you’ll find on the mountain. So one of the activities was a hike along the trail, and a visit to the parts that were being or had just been rebuilt. The crew leaders and volunteers on the Invasives Strike Force go to work on removing barberry plants at Bear Mountain on June 6. Up until now, I’d never really given much thought to the barberry. I’d sort of known it as a source of edible fruit, mainly from reading Marsha Mehran’s Babylon Café novels set in 1980s Ireland. But after volunteering for a morning on an invasive species removal crew up at Bear Mountain and Harriman State Park in New York this past weekend, I found myself knowing a lot more about the barberry (Berberis spp). It’s 2015 – so where are we going hiking this year? Well, Happy (a few days after the) New Year to you, trail heads – hope 2015 is going all right for everyone. Today’s posting won’t be a long one – after all, like all of you I’m still transitioning from “holiday mode” back into the normal grind of things. I’m usually not one to make resolutions (and generally if I do make resolutions, I resolutely do not keep them). But the turning of the calendar has got me thinking about where I want to go hiking this year – and in the process, get more material for this blog (which got off to such a swimming start in 2014).